A photo journey of God’s amazing ways! The year 1993 was a real bummer for Ralph Modica. The company he worked for downsized from 14,000 employees to 2,000. Each day, he wondered if he would still have a job tomorrow. And it felt like God didn’t care. Then in October, his wife, Terry, convinced him to go with her and their two children and a few friends to a Catholic Charismatic Renewal weekend conference, which would be held in Wildwood, New Jersey, a couple hours from their home. The theme of the conference: “Do Whatever He Tells You” from the story of the wedding at Cana (John 2:1-11). Little did Terry and Ralph realize that the Blessed Mother was directing the two of them, just as she had with the wine stewards. Through the speakers at the conference, Mary challenged them to do whatever Jesus asked, which would soon mean following her Son to Florida so they could start Good News Ministries of Tampa Bay. Why was the Blessed Mother involved? Because a couple of folks near Tampa had been praying the Rosary, asking God to bring Good News Ministries, which was headquartered in Pensacola, Florida, to their own home town. 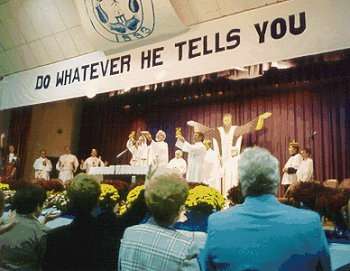 “Do Whatever He Tells You” was the theme of conference that started it all. At the conference, a featured speaker was Charlie Osburn, founder of the original Good News School of Catholic Lay Evangelization. The following January (1994), Ralph took a vacation from his stressful job to attend the Evangelization School with three others from the parish. After all, traveling to Florida in the middle of a N.J. ice storm had to be a great idea! When he returned home, everyone noticed a remarkable change in him. He was peaceful and joy-filled, no matter what happened. His 13-year-old son, David, asked, “Who are you and what have you done with my father?” The family began to wonder: What will happen when Mom goes to the school in March? 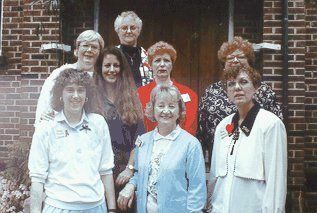 Terry went to the Evangelization School with a few of her friends. As she observed the changes taking place within her and those around her, she yearned to be able to serve God through Good News Ministries because of the impact it had on people’s lives. 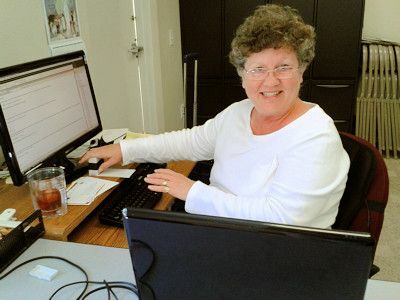 Terry was already serving the Lord as Adult Education Coordinator at her parish. But nothing she had ever taught or seen had made as much an impact on people’s lives as this evangelization school did. Terry wanted to be able to build people up in the Catholic faith no less than that. When Terry returned home, she said to Ralph, “Let’s move to Florida!” This surprised Ralph, because for fifteen years he had wanted to move to Florida and Terry had resisted. 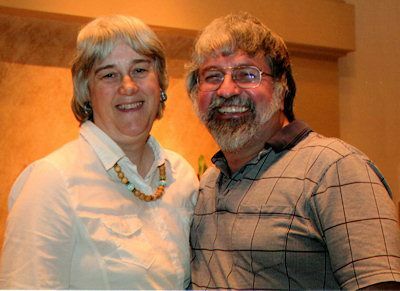 They had begun their marriage and their Catholic faith journey while Ralph was stationed at McDill Air Force Base in Tampa, between 1975 and 1979, and Ralph had long felt a desire to return to their spiritual birthplace. Take a close look at the next picture, taken in 1978. 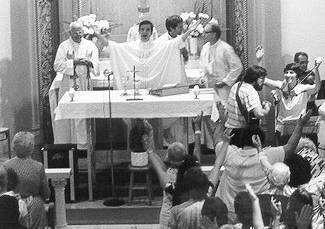 The two priests on the far left and right of the altar are Fathers Fred and John Buckley. They will reappear later in this story! Meanwhile, God took Ralph one step further in His question about trust. He asked: “Are you willing to lay down your life for the sake of My kingdom?” Not an easy question to answer, it did stir Ralph to search for a new job in Pensacola, since that was, at the time, the only home of Good News Ministries. But God closed that door very quickly. Then the ministry came to New Jersey. The parishioners who had been to the Evangelization School teamed up to start the same ministry in New Jersey. This should have excited Terry and Ralph, but strangely they felt increasingly like they didn’t belong there anymore. The urge to move continually increased. 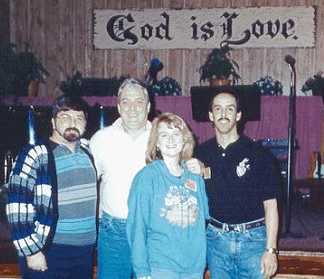 As Ralph and Terry searched for the right place to live, Jesus led them to Brandon, a suburb of Tampa. They moved into their new home on New Year’s Eve — a symbolically appropriate time to begin a new life! On January 30, 1995, Charlie Osburn happened to be in town for a speaking engagement. When he saw Ralph and Terry, he asked them if they would start another Good News Ministries. Having experienced in New Jersey the hard work that this entailed, they wanted to say no. But they nodded their agreement. At that moment, Good News Ministries of Tampa Bay was born. God had already laid the foundation. Father Christopher Fitzgerald, of the neighboring St. Francis of Assisi Parish in Seffner, wanted to host the Evangelization School, and he gladly became Terry and Ralph’s liaison with the diocese to obtain approval for the start of the ministry. One of his parishioners, Donna Obringer, had been praying the Rosary for two years, asking God to bring forth people who could make it happen. No wonder the Blessed Mother visited Terry in Pensacola! In June, the whole Modica family went to the Pensacola school. At the same time, Fathers Fred and John Buckley attended, too. 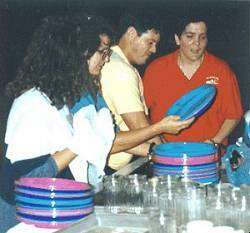 In the photo, they are receiving their graduation certificates from Jeanne and Charlie Osburn. After returning home, Terry and Ralph built a community of volunteers, the core team that God had called and motivated before the Modicas moved to Florida. 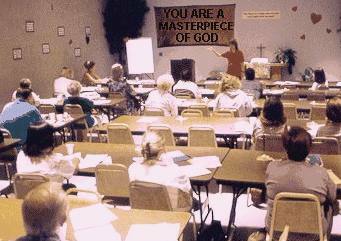 Good News Ministries of Tampa Bay began to provide seminars and retreats. The big event, Tampa Bay’s first full-week School of Catholic Lay Evangelization, loomed closer and closer. It would take place in October, 1995, in St. Francis of Assisi Church. A handful of volunteers pulled together to make it happen. Charlie Osburn and his team from Pensacola came to teach and to help serve. 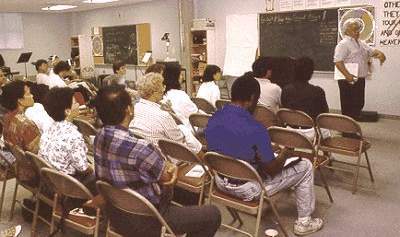 Charlie is seen in the picture below teaching one of the classes. Good News Ministries fed its students breakfast, lunch and dinner, requiring much hard work from its volunteers. Donna Obringer (far right in photo below) headed up the kitchen duties, a huge job with too few volunteers, no kitchen and no dining hall (we used a tent) with help from Jerry Hoffman (second from right) and other volunteers. What an adventure! 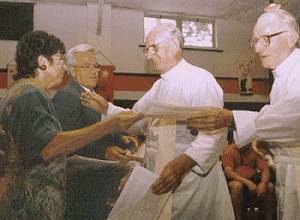 The two brother priests, Fathers John and Fred Buckley, joined us for our first school. They are seen here behind the altar, to the left and right of Father Ed Nichols, who served as the Good News Ministries chaplain for the first couple of years. Good News Ministries continued giving seminars, retreats and parish missions throughout the diocese. 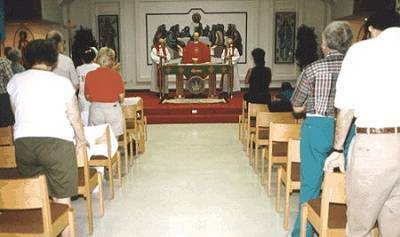 At the end of May in 1996, the second School of Catholic Lay Evangelization convened in St. Stephen Church, Terry and Ralph’s home parish in Valrico. The biggest event of 1997 was a week-long Catholic Bible Conference, provided because of requests to learn more about the scriptures and safely within the teachings of the Church Magisterium. Father Pat Irwin, pastor of St. Stephen Parish, was pleased to have Good News Ministries return to his church for this event. All the events were offered free of charge. God provided from the generosity of His abundance! Food had been ordered to serve participants only breakfast and lunch, but so many donations of food poured in from businesses in the Tampa Bay area, we made dinner available to anyone who could join us. That was Phase 1 of what the Holy Spirit did to build up Good News Ministries of Tampa Bay. 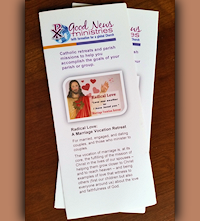 Since then, Good News Ministries has continued to serve parishes and Catholic organizations with evangelization training and faith-building seminars and parish missions. We spread beyond our local diocese, traveling across the US and around the world to Canada, New Zealand, and Malawi. In 1997, problems with their chaplain Father Ed began. He had been raised by two alcoholic parents and was now an alcoholic in denial. Ralph and Terry had to learn what co-dependency means and how to love with the patience of Christ without enabling his addictions, while at the same time asserting healthy boundaries. His wounded personality harmed GNM’s reputation, and some of the original core team members drifted away. The Modicas had to either shut down the ministry or walk the talk and practice what they preached under very emotionally draining circumstances. 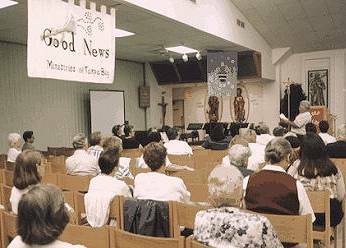 The website gnm.org had been launched in 1996 to promote seminars and parish missions. 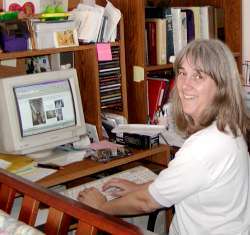 As local speaking opportunities became fewer, Terry increasingly used the website as a venue for continuing the ministry’s mission. 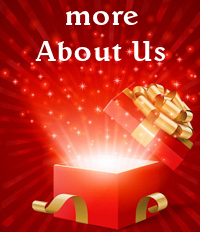 The gift of writing that God had given her poured the Good News teachings into a rapidly growing website. She began to evangelize and strengthen the Catholic faith in people all over the world. In 1999, the daily Good News Reflections began as an email exchange between a few friends. In short time, the number exceeded 200, and Terry asked the Lord in amazement: “Wow, will this grow much bigger?” Today, the reflections are emailed to 15,000 subscribers, and other email ministries have been launched to spread the Good News, too. Over the next ten years, Ralph supported the growth of Good News Ministries through his work in the computer industry, enabling Terry to focus on building up what could be accomplished over the internet. Occasional speaking trips fine-tuned Terry’s (and sometimes Ralph’s) abilities as parish retreat presenters. The ministry grew to be too much for Terry to handle by herself. In 2009, Michael Jones was hired as her Ministry Assistant. 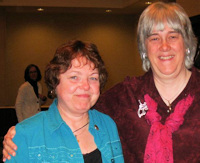 In 2010, Joanne McGuire was contracted to assist with GNM’s growth and development. Now, a real office was required. It would be the largest expense they had dared to dream of praying for. So, Terry asked God: “Do You think we should get an office?” Later that day, a reader of the Good News Reflections sent a donation of $3000. Taking that as a sign that God was saying a big “YES!”, she enlisted the prayers of others and took a leap of faith by looking at office spaces. Then, without publicly announcing the need, Terry received an envelope containing a $10,000 check! She and Joanne immediately looked at an office that would cost $800 a month, and it was perfectly suited to GNM’s needs. 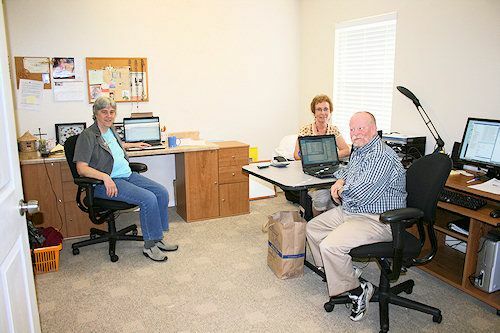 Good News Ministries moved into the office February, 2011. Ralph and Terry’s talented daughter, joined the staff to build up the video ministry that Terry had begun in her living room. She produced a feature-length DVD about the Mass. GNM’s first Director of Video and Digital Media was Tammy Modica. On March 1 , 2011, Our Lady arrives at the office!!! 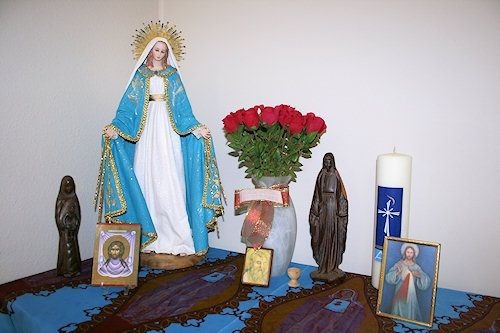 The statue of the Blessed Mother, by artist Alicia Varela in Caracas, Venezuela, was chosen by Mary herself to represent her presence in our new office, according to Laura Rojas who donated it to Good News Ministries. We’ve produced a Holy Card of this; see our Prayer to the Virgin of Miracles. The shrine at the office includes cloth and two hand-carved wooden statuettes from Terry’s 2004 mission trip to Malawi. The vase is a gift that Ralph had given to Terry, representing the alabaster jar from which Jesus’ friend Mary poured expensive perfume onto his feet (see John 12:1-11). And the tiny olive-wood chalice is a momento from the year 2000 when Terry and Ralph went to the Holy Land for a second honeymoon, celebrating 25 years of marriage. On April 9th, we celebrated our new office with an Open House. Father Larry Rice, CSP, blessed the facilities and gave a presentation about St. Paul. Later that year, Kathy Taylor was hired as office assistant and bookkeeper, and Joanne moved away to another state to live near family, although she continues to volunteer her expertise as a consultant. 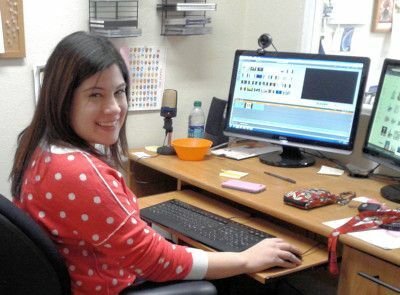 In 2012, an enthusiastic high school student, Daniela Delvescovo, became a digital media assistant until she went off to college. 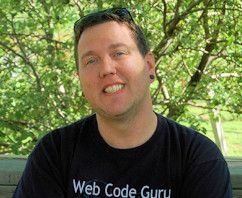 In 2014, Jeremy Lewis was contracted to completely redesign and update our websites, which by now needed to be overhauled to work well on the increasingly popular smart phones and tablets. And after Michael moved away, Graciela Mabel Ribot was contracted to serve as our bilingual Ministry Assistant, expanding our potential to fully ministry to Hispanics around the world. 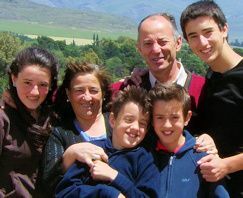 In 2016, her husband, Fernando, became a member of the staff, too, to increase the ways we minister in the Spanish language. See Terry’s 2004 Mission Trip to Malawi. Listen to Terry’s 2010 Retreat in New Zealand.